One of the most rewarding careers in the field of the culinary arts is that of a chef instructor. Not only do you get to cook in some of the finest restaurants as a master chef, but you could also share your expertise with the rest of the cooking world of restaurant owners, future chefs, and restaurants of renown. 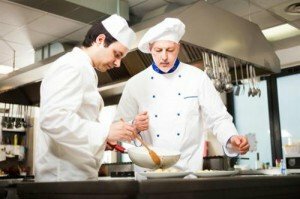 So what does it take to be a chef instructor? A chef instructor is first a master chef. So, if you are not that great in the kitchen preparing meals, this career is not for you. A chef instructor is first a master chef. So, if you are not that great in the kitchen preparing meals, this career is not for you. But, if you excel in the culinary arts, and you want to teach others what you know, becoming a chef instructor is not so difficult. You simply need to take the coursework necessary to understand various aspects of the business, and have a desire to teach others. Being a chef instructor can be a rewarding profession because you get to train future master chefs who may reside in some of the world’s most prestigious restaurants. The typical educational track for a chef instructor would include a certificate in chef studies or culinary arts degree or certificate from an accepted university, school, or online institution. Look for courses dealing with the art of cooking, as well as how to deal with specific foods. Health and safety are of utmost concern in this profession, since it is a field that deals with serving people food in a public place. Make sure the program you are enrolling in deals with these issues, so that you will be the best prepared to excel in this career. Teaching courses should also be offered. Though you don’t need an Education degree, nor a teaching certificate to do this in most cases, the requirements will depend upon the setting in which you plan to work. It would also help if you had at least one course dealing with how to formally instruct others. 1) Complete your education in a culinary field. Whether you decide to get a 2-year or 4-year degree in the culinary arts (recommended), or certification in this field, it is essential to first lay the groundwork by getting the best educational background possible. Choose a program which focuses on how to handle food, safety issues, and the art of being a good chef. 2) Master your craft as a chef first. Before you can teach others, you need to become an expert yourself. It is difficult to train others to drive a boat if you do not know how to do so yourself. So learn all you can, focus on your own ability and talents in this field and build a reputation as a "master chef." Then word will get around and you will be highly sought after as a chef who could teach others. 3) Gain certification. If you have not done so already in your previous educational background, you will need to get certification in areas that are required of a chef instructor. In some cases, you will be required to get an education or teaching license. While this is not always the case, find out what the requirements are in the setting in which you wish to work and get the proper credentials. 4) Teach others on the job. Even if you are not a chef instructor yet, get in the habit of teaching others what you know on the job in the kitchen or restaurant in which you currently work. Managers will notice your talent and this may prove invaluable later, when you need their recommendation to move into an instructor type position. 5) Make a demo video. You could make a video of your cooking expertise in an instructional manner for You Tube. Choose a recipe you know by heart and film every step, showing your expertise in cooking, as well as the ability to instruct others. People may see it on You Tube and you could be discovered by a well-known establishment. Or download the video and use it to show area restaurants, etc. A career as a chef instructor offers the best of both worlds for those who are blessed with a culinary arts ability. Not only do you get to cook perhaps in some of the finest restaurants around, but you also get to show others your skills by teaching them how to do it. So, if you possess this ability, go for it, and remember, if you can’t stand the heat, turn down the burner! Now, get cooking!